One of the unintended benefits of my career are the conversations I get to have with experts working in different parts of organizations, bridging needs to knowledge. These posts build on conversations with clients and friends. They come from different parts of organizations (data scientists, business analysts, software engineering, sales, marketing and customer leads). They often think of their customers differently. This is a place to share some of those ideas providing a peek into what is happening on the other side of the organization. Ah, Sales data. Your company’s Sales leadership (hopefully) relies on it to drive priorities and tactics. But the same data can, and should, be used to drive decision making far beyond the Sales department. Sales data is just another form of customer data… and it’s a treasure trove of information on customer behaviours that can be used to drive business decisions. Bill has been an early navigator of business intelligence with a deep history in e-tailing (Rent the Runway, GILT, now VP BI @ SLICE). As a data analyst, he is skilled at many forms of analysis but reminds us that there is foundational work that most organizations can pursue without delving into deep analytics. Any organization trying to optimize services based on sales data has many tools at hand to start their analysis. Examine your sales data for spikes and troughs: If you’re just starting out, select a time period: last week? last 6 Wednesdays? this time last quarter/year? Determine the triggers: You have obvious sources like what your business controls (sales, inventory), and the not-so-obvious sources for these anomalies (sporting events, weather events) that could be a trigger for changes in sales. Test your hypotheses: Implement some service offerings or marketing pieces for different segments of your market to validate your ideas. You can start to filter out your hypothetical variables (for example, is something driven by a brand feature? An offer? A segment or demographic). Uncover the stories: When it comes to gathering and processing data, you have almost too many options to choose from. If you are new to this, you’ll probably want to start with free or inexpensive ones like the ones from Google, Facebook, or Canopy Labs. 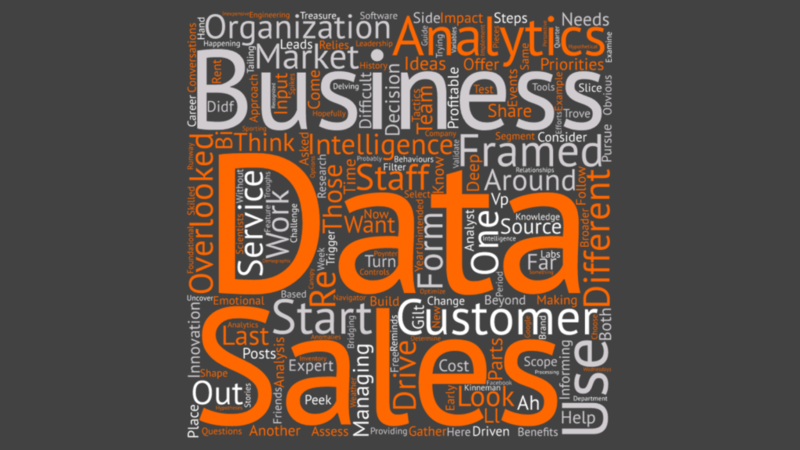 Following these steps, your sales data can guide innovation efforts for your organization. Let’s turn to another perspective on customer data, using this for informing how you service your clients. Ray Poynter: Sales data for client management. Ray is a recognized expert in research, and is most often cited sharing innovations in marketing research to help support business decision making. As the head of his own practice, Ray has used data to drive priorities around client management. Difficult clients can be a challenge for any client services team. They can be challenging because they often change scope, or just have a personality that is disrespectful to your staff. Ray’s team started to think about these clients, beyond numerical profitability to issues of productivity and the true cost of managing these accounts. Think about this in terms of your staff. If they are unhappy with a difficult client there is an emotional burden that creeps into the organization. And, if you lose staff, there is the cost of dealing with employee churn for replacing these team members. My own experience echoes Ray’s assessment, it turns out that the clients your staff does not want to work with may not actually be profitable (in both strict and broader definitions). In Ray’s analysis, those that asked for unpaid extras were the least profitable and it raised many internal questions on whether they wanted to continue to pursue work with those clients, and certainly impacted scope management. Sales data is a powerful and frequently overlooked source of customer data, but customer data and customer insights are all around you if you know where, and how, to look for them. In the examples above, we covered two effective and easily accessible approaches. The value hidden in your data doesn’t stop there though. It is a matter of looking around to understand how data can be found in different forms than how you often consider, and can be re-framed in service of your business needs.